For the next two weeks, fifty children from Mt. 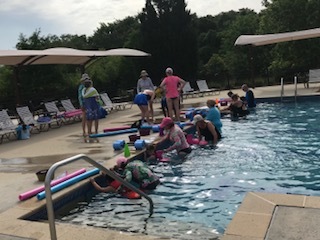 Zion and Edith Frierson Elementary schools will be taught water safety and basic swim techniques by a group of Seabrook and Kiawah volunteers. Though free to the kids, it costs over $110 per child to transport, equip and pay our lifeguards, and insure the kids. Donations are desperately needed to finance our September program and ensure that we can keep up this amazing and potentially life-saving program. Please send your donations to our 501(c)(3) tax-exempt charitable organization, “Waterproof Inc.,” c/o Derek Fyfe, at 1014 Embassy Row Way, Seabrook Island, SC 29455. This entry was posted in Fundraisers, Lake House. Bookmark the permalink.